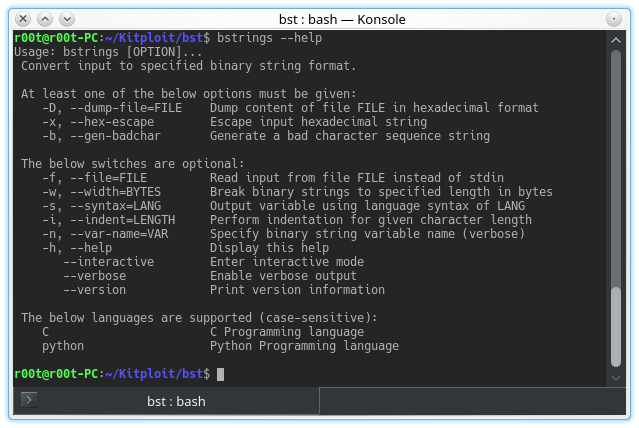 The Binary String Toolkit or BST for short is a rather simple utility to convert binary strings to various formats suitable for later inclusions in source codes, such as those used to develop exploits in the security field. Dump files content to standard output in a binary string format. Convert a plain hexadecimal input to an escaped binary string. Output a sequence of bad characters for testing proof of concept code. Limit the width of binary strings for better readability in source codes. Format output in your favorite programming language's syntax. Perform binary variable block indentation. # by default, bstrings is installed in /usr/local/bin. [*] Convert hexadecimal input to an escaped binary string. [+] Binary string width is limited to 8 bytes. [+] Output binary string using python language syntax. [+] Indentation level set to 4 space character(s). [*] Generating bad character binary string. [+] Binary string width is limited to 12 bytes. Convert input to specified binary string format.